By E.J. Schultz . Published on June 25, 2018. Heading into the final game of the regular season, the Minnesota Timberwolves had more than a playoff berth on the line—a portion of the NBA team's beer sponsorship money also hung in the balance. The franchise operates under Anheuser-Busch InBev's new sponsorship model, under which teams, leagues and other so-called rights holders get paid more if they reach certain goals, like making the playoffs. The incentive-laden arrangement, which the brewer recently began rolling out to some of the more than 80 pro teams it sponsors, represents a sea change in the world of sports sponsorships, in which multiyear deals with fixed fees have long been the norm. For the Timberwolves, which hadn't been to the playoffs in 14 years, it was a bit of a gamble, but one the team wanted to make. "We were willing to bet on ourselves," says Timberwolves Chief Revenue Officer Ryan Tanke. And it paid off: The team made the postseason after beating the Nuggets in an overtime thriller on April 11. For AB InBev, the calculation is simple: Fans of winning teams buy more tickets—and ultimately more beer. But the brewer isn't stopping at wins and losses. 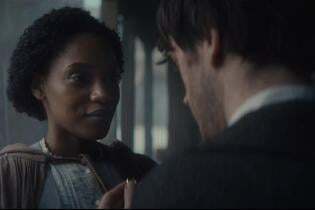 It is layering in a range of metric-based incentives, like reaching a certain number of eyeballs with Budweiser-branded social media videos produced by teams. The Timberwolves will even get paid more if Budweiser's market share jumps in the Twin Cities over a 12-month period, Tanke says. The results-based model comes as marketers put more scrutiny on sports deals once powered by access to tickets or traditional media buys like TV, radio and billboards aimed at coveted male audiences. But for most big brands, simple awareness no longer cuts it, because those audiences can be found in less expensive ways, like through targeted digital media, which does not come with multimillion-dollar sponsorship fees. "Ten years ago, it was guys and sports. 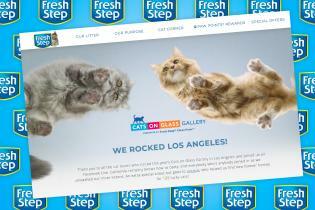 Well, guys are everywhere now," says Brian Gordon, CEO of experiential agency Engine Shop. "Data has allowed marketing to understand where," he says, citing new interest from men in culinary trends as one example. "All of that is fragmenting the spends and the dollars in much more efficient and niche ways." Televised sports remain a ratings behemoth. But some troubling signs are on the horizon. The NFL lost 9 percent of its TV audience last season from a year ago (although games still accounted for 37 of the year's top 50 broadcasts), as Ad Age recently reported. At the same time, the National Football League's total regular season attendance dropped to 16.4 million in 2017 from 17 million in 2016, although the 2016 figure was the third-highest on record, according to the league. What's more worrisome is the graying of sports audiences. Magna Global last year conducted a study for SportsBusiness Journal and found that 23 of 24 sports analyzed saw their median age of TV viewers increase in the past decade. The NFL's median viewing age jumped from 46 in 2006 to 50 in 2016, while Major League Baseball's changed from 52 to 57. "TV viewership is down, venue attendance is down. 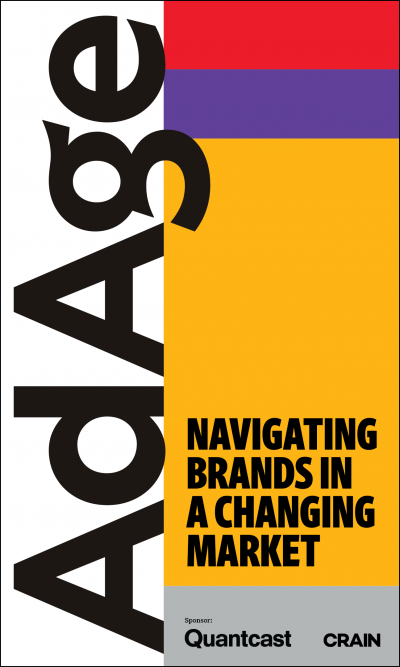 For us as brand builders, it's much more challenging to grab consumers' attention," says Marcel Marcondes, AB InBev's U.S. chief marketing officer. "We need to evolve the way we bring our [sports] relationships to life." There's a lot at stake: The brewer spends more than $350 million annually on all its sponsorships in the U.S., second only to PepsiCo, according to the latest data from WPP-owned sponsorship consultancy ESP-IEG. So executives hope their new incentive-based approach resonates widely across the sporting landscape. "It's all about behaving again with a leadership mentality," Marcondes says. The sports sponsorship industry remains healthy. Spending on the four major pro leagues reached a total of $3.5 billion for the 2016-17 season, up from $3.3 billion the previous season, according to ESP-IEG. For 2017-18, spending on the NFL and its 32 teams jumped nearly 6 percent to $1.3 billion. The haul could rise by millions, if not billions, as brands seek sponsorship opportunities related to sports gambling following a Supreme Court decision earlier this year that cleared the way for states beyond Nevada to allow legal betting. Picture the NBA striking a deal with a casino brand as its "official gambling partner," for instance. "This is going to be one of the largest, if not the largest, sponsorship categories, once things get going," says Jim Andrews, a senior VP at ESP-IEG. But as brands shell out millions to be everything from the official beer to the official bank, marketers are demanding more access to content and fan experiences that only teams and leagues can provide. "The power is beginning to shift from what the rights holder wants to sell to what the brand needs to buy," says Engine Shop's Gordon, whose agency does a lot of work for brands at sporting events. That's translating into more brands injecting themselves into slick in-stadium experiences like virtual reality tech or concession upgrades. "The goal for us is to think experience first, and all the traditional sports stuff second," Nick Kelly, A-B InBev's head of U.S. sports marketing, told industry experts at a recent ESP-IEG conference. At Washington Redskins games, fans can wear VR-equipped football helmets at the Bud Light Social Lounge that reenact what it's like to walk onto the field as a player. The Minnesota Timberwolves recently rolled out in-seat concessions delivery for some premium seats, where fans order via a mobile app, giving the team a way to study ordering habits. That might allow for promotions like crediting a free Bud to loyal drinkers, Tanke says. 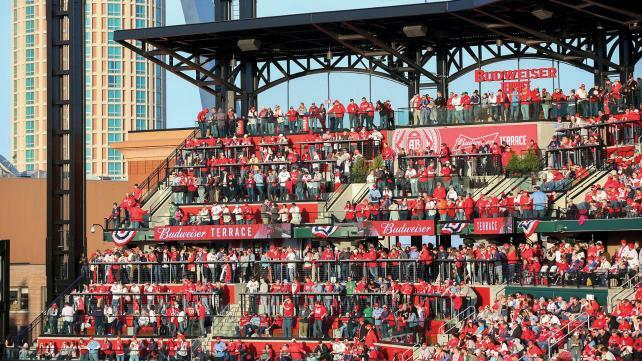 In an attempt to attract younger fans to St. Louis Cardinals games, Budweiser worked with the team to sell monthly passes to the Budweiser Terrace above right field where fans mingle without assigned seats. The passes auto-renew each month, but fans can opt out. "The millennial consumer is used to that with Netflix and Hulu and everything else," Kelly said in an interview. With TV technology constantly improving, teams must do everything they can to convince fans that a trip to the stadium is still worth it. 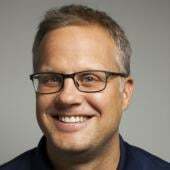 "There's been a massive trend in stadiums opening up three, four hours earlier so people can really take in the game day experience that you really can't get at home," says James Giglio, CEO of MVP Interactive, which creates in-stadium experiences for brands, including the Bud Light Social Lounge. Sometimes, it's the simple things: like keeping beer cold. 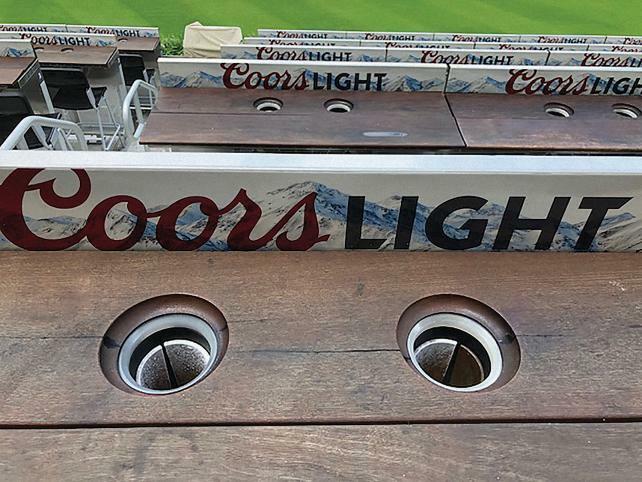 Coors Light, which sponsors the Atlanta Braves, has installed rails of branded refrigerated cup holders at the team's SunTrust Park in a section of the stadium in right field called the Coors Light Chophouse. Fans "don't go to a sporting event to seek out one of our brands. They go to root for their team," says Adam Dettman, director of brand experience at MillerCoors. So brands should focus on "how do you make that experience better." 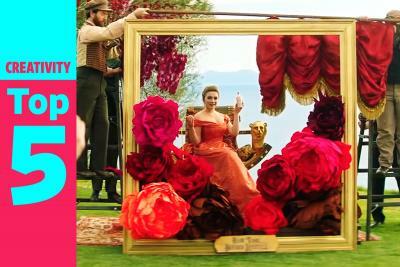 Visa uses its sponsorships to show off fancy new payment methods. At the FIFA World Cup in Russia, where Visa is the exclusive in-stadium payment method, the brand is distributing wearable payment devices like rings and wristbands. Visa, which is also an Olympics sponsor, at the Winter Games in Korea sold special gloves, commemorative stickers and Olympic pins that allowed fans to pay with a simple tap at any enabled terminal. The events are "a punctuated moment on the calendar where we can say, 'This is what the future of payments looks like,' " says Chris Curtin, Visa's chief brand and innovation officer. JPMorgan Chase dedicates most of its sponsorship dollars to venues, rather than teams, so it can take advantage of its investment nearly every night of the year as stadiums fill for sports and concerts. The company prefers this to sponsoring tours, like it did a few years ago when it slapped its name on the Jay-Z/Beyoncé tour. "The downside of a tour is you don't control the ultimate experience where it happens, the venue," says Frank Nakano, JPMorgan Chase's head of sports and entertainment. JPMorgan Chase has a major deal with Madison Square Garden Co., whose venues include its namesake New York arena, as well as Radio City Music Hall, the Chicago Theatre and the Forum in Los Angeles. Chase cardholders get early access to preferred seating and entry into pregame venues branded the Chase Lounge for complimentary food and drinks. The company put its name on the Chase Center in San Francisco, where the Golden State Warriors will play when the venue opens for the 2019-20 season. The 20-year naming rights deal did not come cheap: Media reports pegged the value at more than $10 million annually. In the shadow of Silicon Valley, the $1 billion venue promises to be among the most technologically advanced venues in the nation. The Warriors signed Accenture as its official "technology innovation" sponsor, meaning it will lead the development of techy, data-driven fan experiences. The consulting firm, which signed the deal in late 2016, plugged it by handing out Accenture-branded virtual reality viewers at a Warriors game last season at their current Oracle Arena home in Oakland that featured an inside look at the team. But for some fans, that might be as close as they get to the team, once it moves into the Chase Center, where tickets prices are expected to be some of the costliest in the nation. Season tickets for one premium seat location will run $600 per game, plus a refundable $35,000 membership fee that won't be returned for 30 years, the San Francisco Chronicle reported recently, noting that some fans had "sticker shock." One fan on a fixed income told the newspaper that "I love the team, I love the game" but "I'm not a corporation. They just priced me out."